Konstantin Raudive used a germanium diode and some other small parts to create essentially a radio frequency microphone to be used for EVP research. Many have claimed success with this device over using a regular microphone. 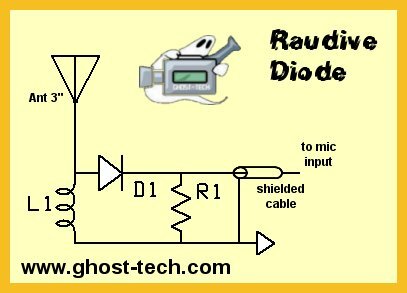 Be sure to leave about 3-4 feet of wire between the recorder and the diode so the diode can be placed away from the recorder as not to pick up the interference of the motor drive. The antenna should be about 3 inches of thick wire at least 14 guage or so.